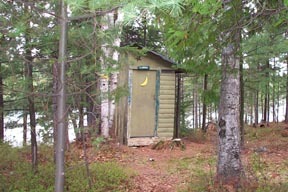 Our old facilities were "full" and the ladies were complaining, so we set about constructing new indoor conveniences. The results have been highly satisfactory, and we would like to share our findings. Please see the photographs below for details of the new indoor fixtures. Please note that this is a free website, so I really shouldn't do any "advertising" such as mentioning company names. Thanks to Bill, Nicole, Jean, Doug and everyone at the hardware store for the technical advice and assistance. We built a good, solid frame using "2X4" spruce. with a strong frame of two-by-six spruce lumber. 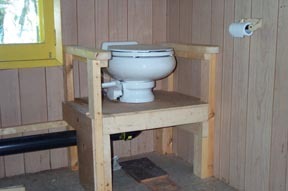 The toilet had to be elevated as shown in order to allow for sufficient height above the inlet to the composter. 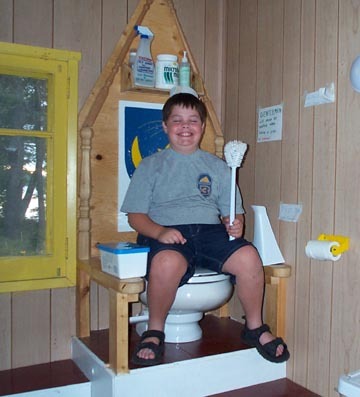 Many comments were made about this height and the similarity to a "throne", so Mr. Sewell finished it up like a throne. The crest with the moon and star was designed to remind nostalgic users of the former facilites. The natural wood parts are finished using a water base polyurethane, the white parts are finished with a water base bathroom enamel and the horizontal maroon surfaces are finished in oil base porch and floor enamel. 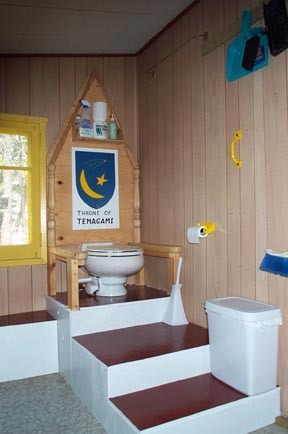 Shelf for special cleaners; regular bathroom cleaners must not be used in a composter. Container for waste; excess tissue, cigar stubs, wine corks, etc. 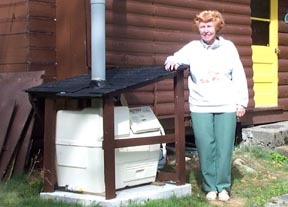 seem hard on the composter. Toilet brush readily available, but the high-quality porcelain finish on the bowl is very satisfactory. Handgrip on the wall to assist the elderly and/or inebriated. to represent the king's sceptre. We built a good, strong concrete base for the composter to sit on. 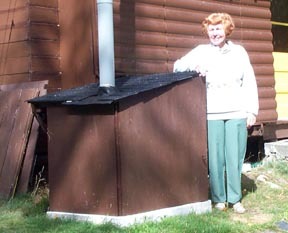 Note the vent pipe (which my nephew refers to as "the stink stack") is well clear of the peak of the roof. Please note as well that despite my nephew's crudities, there is virtually no odour from this device. The composter is supposed to be weather tight, but we found that rain water dripping from the roof entered and flooded the device. 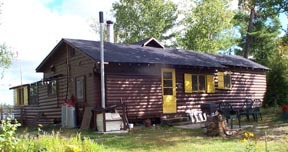 We built a roof as shown along with shutters to be installed for the winter. This really wasn't so bad as we planned on building some sort of winter enclosure anyway. Closed up for the winter.